Mary Kondo Flores, 101, of Beaumont, died Wednesday, January 30, 2019, at Spindletop Hill Nursing and Rehabilitation, Beaumont. She was born on February 15, 1917, to Fumi Takahashi Kondo and Sataro Kondo, in Orangefield. Mary was a registered nurse for thirty years and worked at Hotel Dieu, St. Elizabeth Hospital, Baptist Hospital, and St. Mary Hospital in Texas City throughout her nursing career. Survivors include her nieces, Beverly Burns and her husband, Paul, of Houston and Marianne Kondo of Beaumont; nephews, Kenneth Kondo and his wife, Rhonda, of Liberty Hill and Bill Kondo and his wife, Donna, of Port Neches; great-nieces, Allison Kondo of Fannett and Laura Burns and her husband, Richard Harmon, of Houston; great-nephews, Kenny Kondo and his wife, Cat, of Maryland; James Burns and his wife, Kristen, of Houston; Jacob Kondo and his wife, Jenny, of Austin; Kyle Kondo and his wife, Dianna, of Humble; and Alan Kondo and his wife, Ashley, of Mont Belvieu; and ten great-great-nieces and great-great-nephews. She is preceded in death by her parents; husband, Joseph Flores; four brothers; and four sisters. A gathering of Mrs. Flores’ family and friends will begin at 1:00 p.m., with her memorial service to follow at 2:00 p.m., Saturday, February 9, 2019, at Broussard’s, 1605 North Major Drive, Beaumont. A committal of her urn will follow at Forest Lawn Memorial Park, Beaumont. Memorial contributions may be made to The Humane Society of Southeast Texas, P.O. Box 1629, Beaumont, Texas 77704; or Forest Park United Methodist Church, 225 South Major Drive, Beaumont, Texas 77707. So sorry your loss. She lived a full and rewarding life. May memories bring you all comfort in the days ahead. 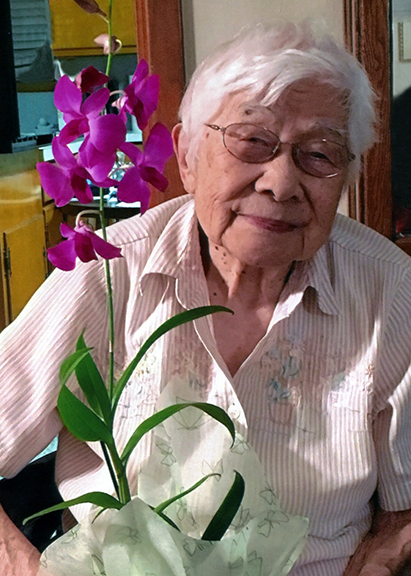 Aunt Mary Flores (Kondo) was a compassionate person who took up God’s calling to become a nurse and caretaker. I have met a lot of people who told me what a wonderful person she was when they were in her care while they or a loved one were in the hospital. She also cared for her brothers, sister, husband, and parents when they could no longer care for themselves. Her caretalking gift from God I feelwas why she had lived longer than her immediate family. She was also thought highly of by other nurses and doctors. Her God given gift has touched many lives. She has now gone to be with God and her family. We have been blessed to have been with her over the years. Sorry for your loss. Keep your memories in your heart. Prayers coming your way. So sorry for the loss of your aunt, Marianne, Bill and Kondo family. Peace be with you all in this time of sadness.